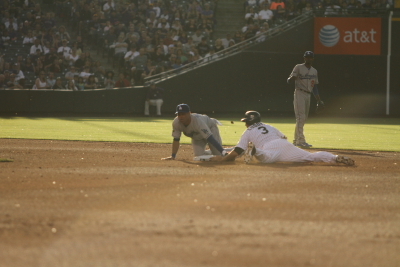 Kemp takes a hit! 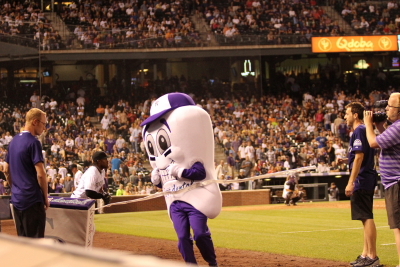 The rest of the game he would sit! 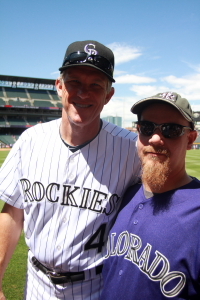 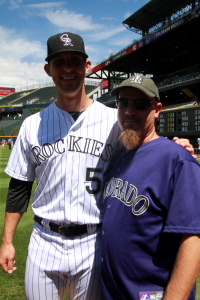 My 48th game at Coors this year! 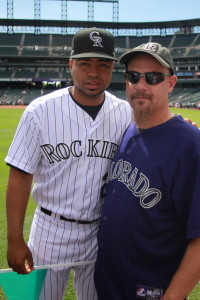 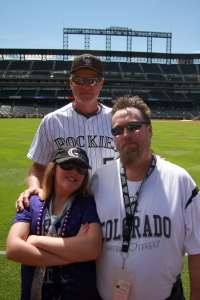 This day started early once again I headed to lodo about 2 hours before gate to hang with the Ranter. 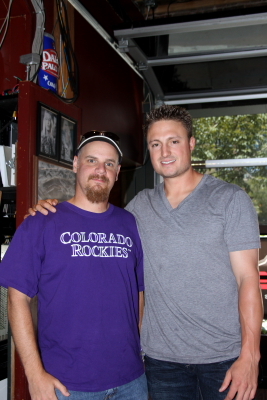 We headed towards Jacksons for a few drinks before heading in for BP. 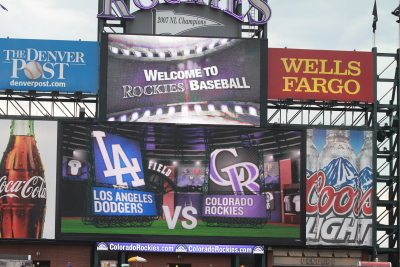 After heading in we immediately headed the pavilions. 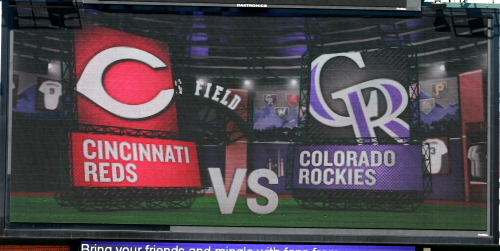 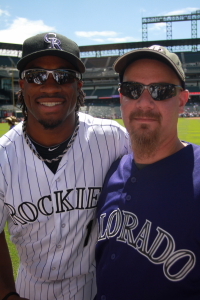 Within a few minutes I got the first ball hit out by the Rockies. 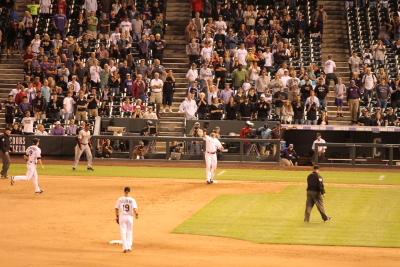 it hit about 2 rows behind me and bounced back. 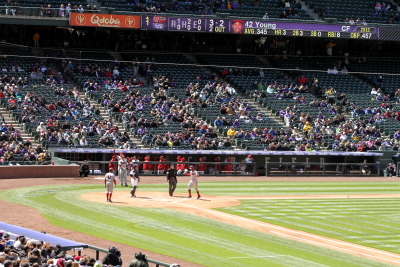 This was my 19th ball of the year in MLB ballparks counting te 1 from Atlanta. 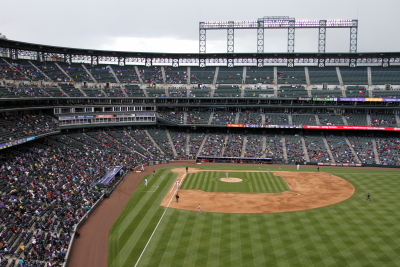 Not very good numbers for the amount of games attended. 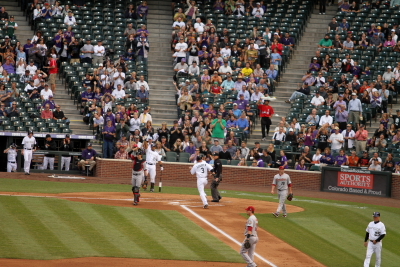 I should have had another but I was going into my bag for something when it was hit about 6 feet to my left. 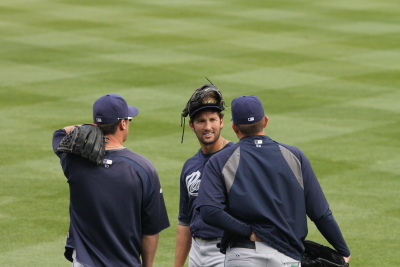 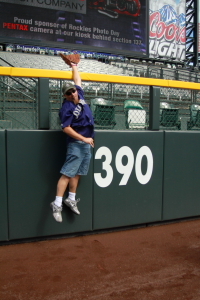 During the end of BP I had given up on catching baseballs and headed towards the Dodgers dugout. 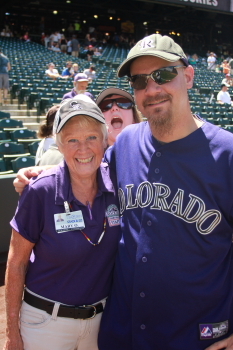 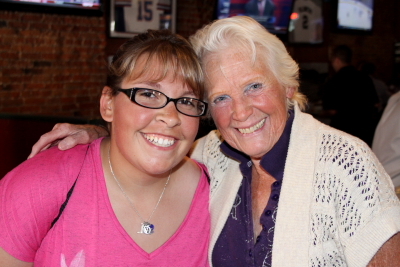 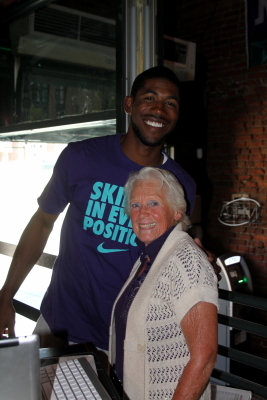 I was trying to get a Jaime Wright photo signed. 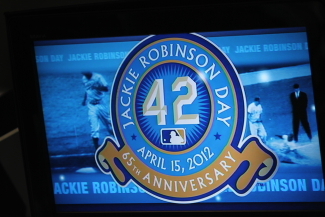 I did not get him but did get a Clayton Kershaw on a Dodger stadium 50 Anniversary ball. 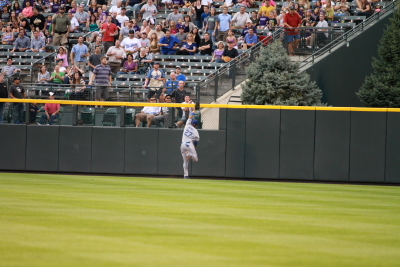 unfortunately he signed it on the Rawlings Logo side in marker. 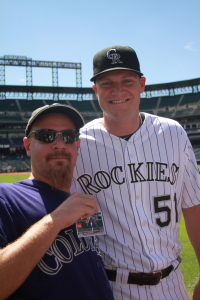 After that I headed over to the Rockies side and got a Tyler Colvin card signed and a Josh Ruttledge card signed. 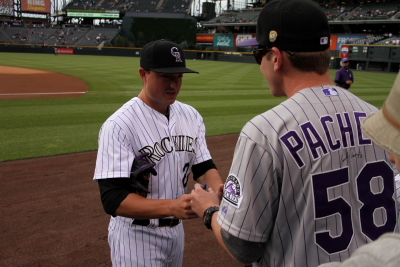 Jordan Pacheco also signed as always. 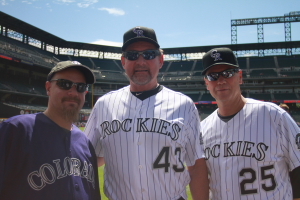 Thanks guys for being so cool to the fans continually. 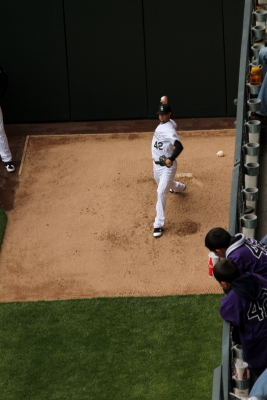 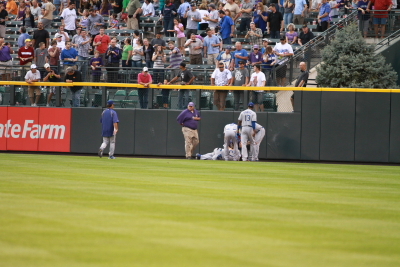 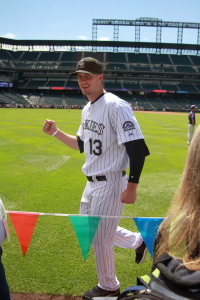 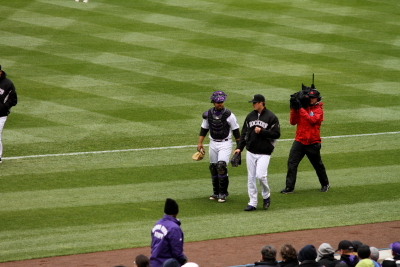 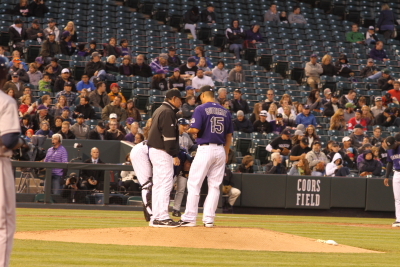 Tyler Chatwood was the Starter for the Rockies this game here he is with “The Baby Bull” Wilin Rosario heading to the dugout from the bullpen. 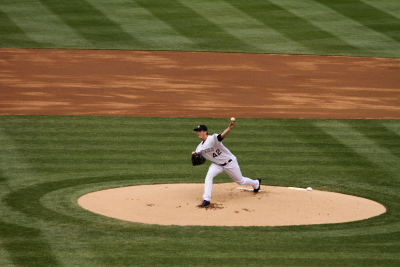 Tyler Chatwood throwing the first pitch to the Dodgers Mark Ellis. 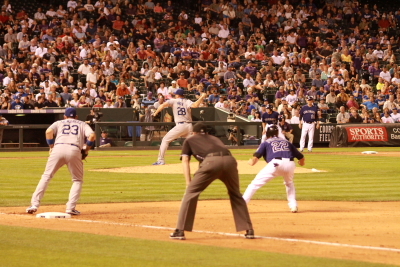 Mark Ellis would reach base on a strike out passed ball. 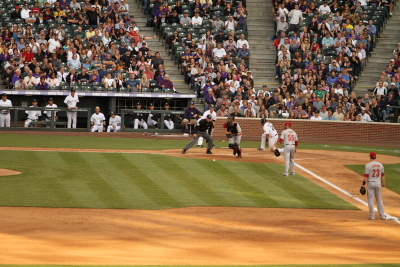 He would get out on second on a Shane Victorino hit to second. 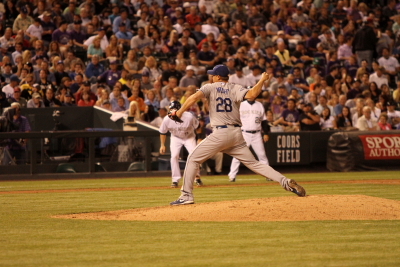 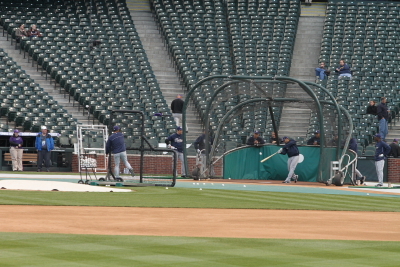 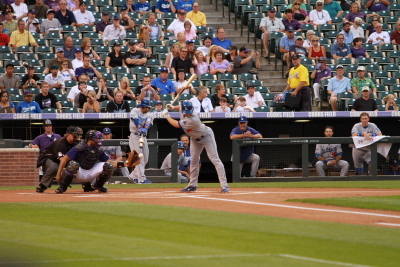 Mark Ellis takes a pitch inside during his at bat. 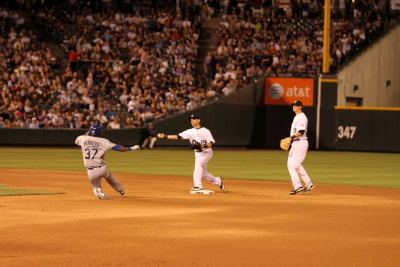 In the inning Victorino would steal second Matt Kemp would be walked and Adrian Gonzalez would hit into a double play. 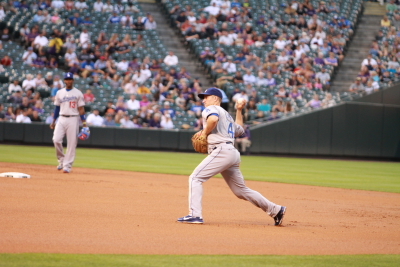 Mark Ellis throwing to first base to get Tyler Colvin out in the first. 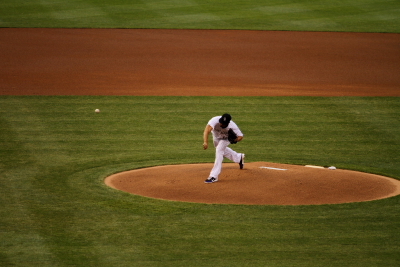 Chris Capuano started for the Dodgers. 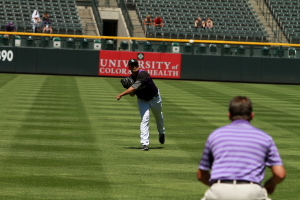 Here he is throwing to Josh Ruttledge. 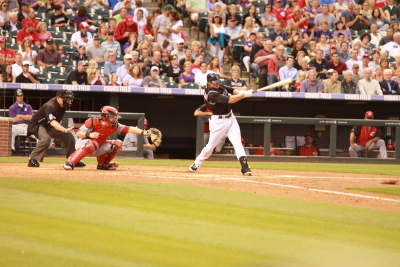 Josh Rutledge would hit a shot deep to left center. 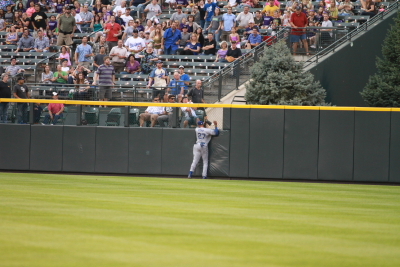 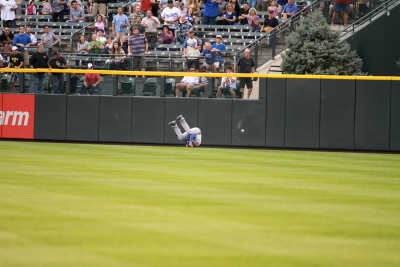 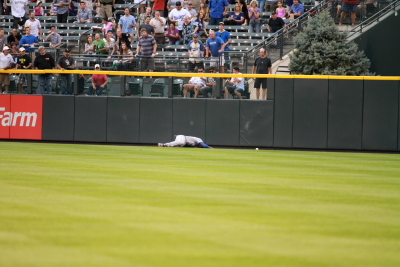 Matt Kemp watch out for the wall!!! 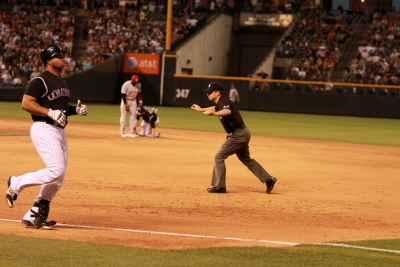 ooh he did not hear me! 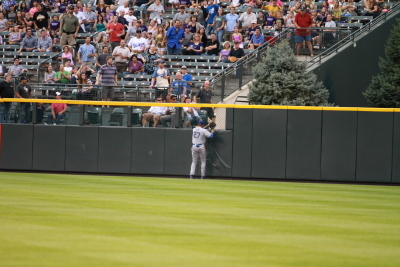 II think we still need to give Douglas a stop sign for the center fielders out there! 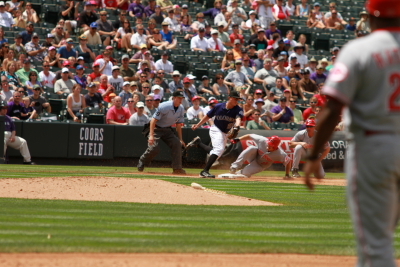 He hit hard… …and fell harder. 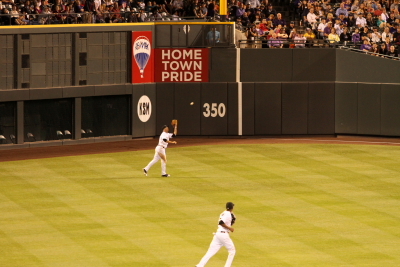 The ball which it looks like he did catch the ball but it popped out of his glove. 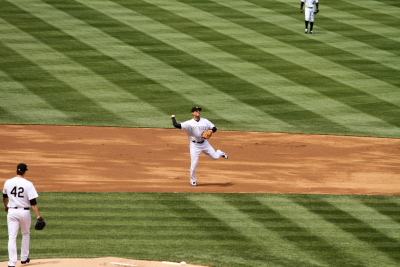 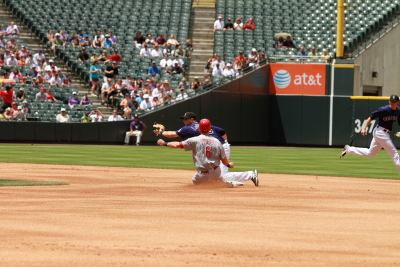 Shane Victorino came to make the play from left. 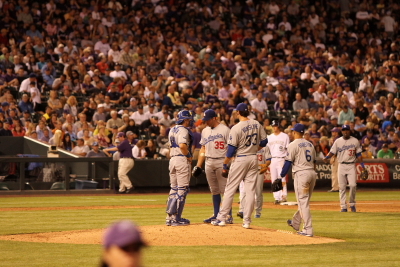 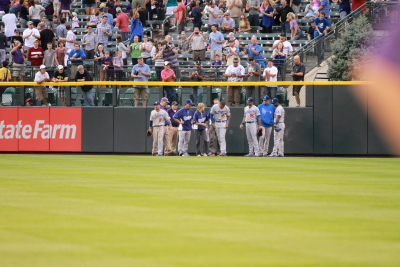 Kemp stayed down for a few minutes. 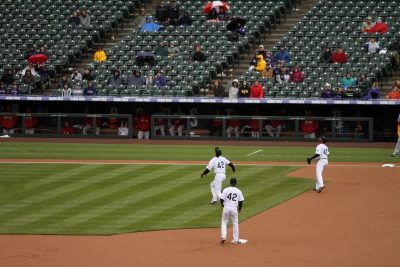 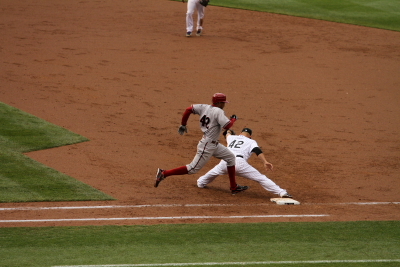 Josh Ruttledge made it to third on the play. 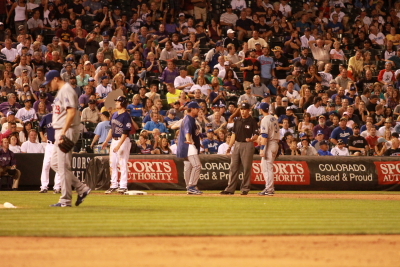 Don Mattinly and the Dodgers training staff immediately ran to the out field as well as the Coors Field security staff. 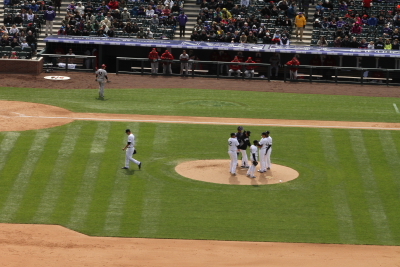 after a few minutes he stood up appeared to be O.K. 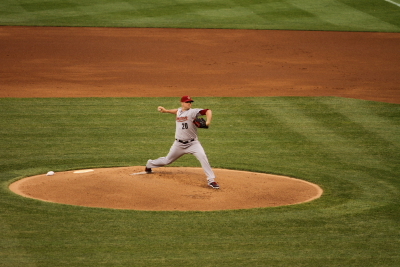 and remained in the game. 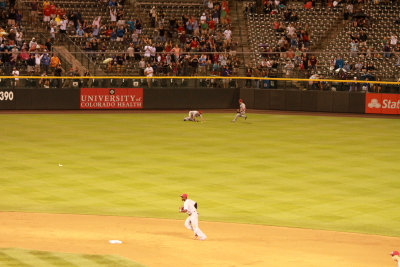 Jordan Pacheco would than hit a ball to shallow left field. 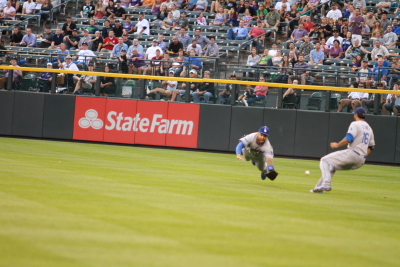 Matt Kemp as a true professional than dove for the ball. 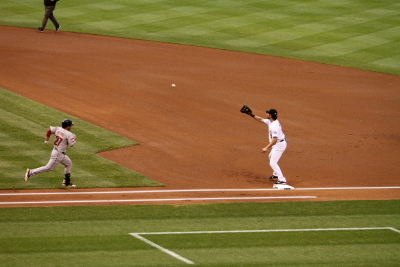 He missed it after the first hit I think he should have went for the one in the middle but guess he did not get the ball. 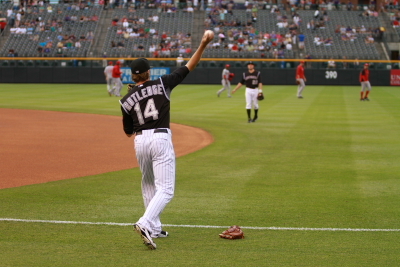 Ruttledge would score and Pacheco would get to second. 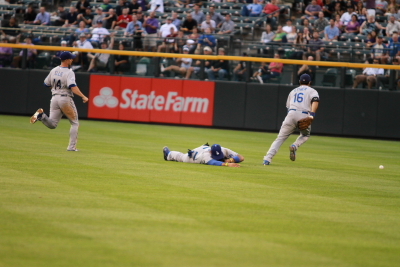 Andre Either runs after this one. 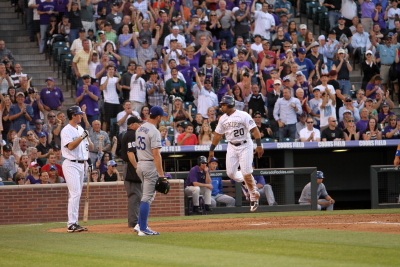 matt Kemp would than start walking off the field. 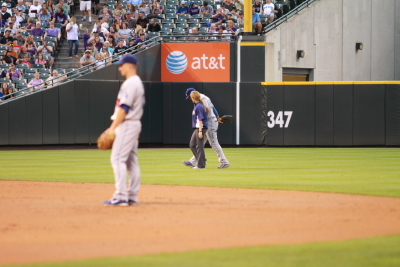 The Dodgers trainer would head out and walk in with him. 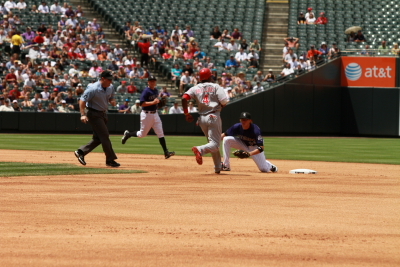 Wilin Rosario jumps back to first. 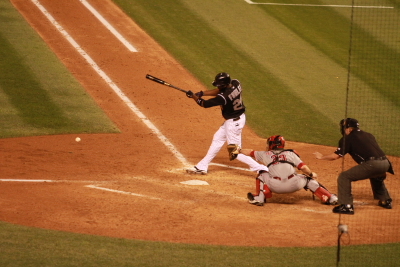 Andrew Brown would hit a double scoring Rosario. 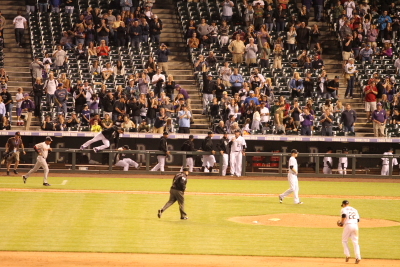 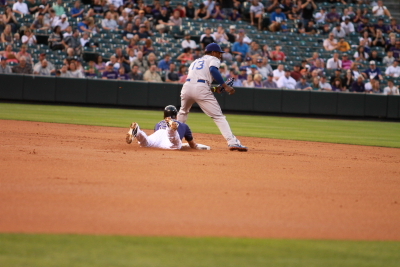 (3-0) Rox The Rockies would score a fourth run when D.J. 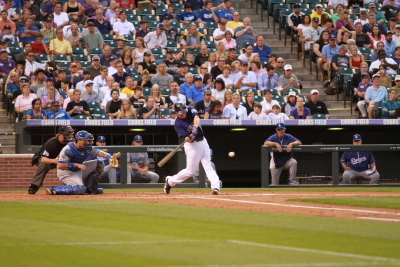 Le Mahieu also hit a double and Brown scored. 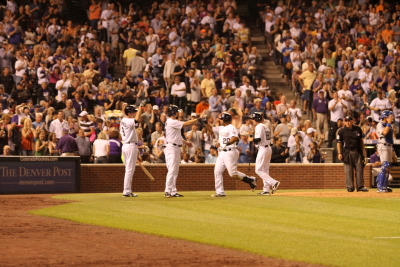 (4-0) Rox. 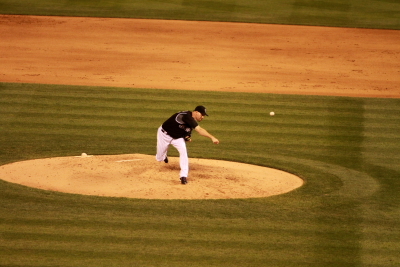 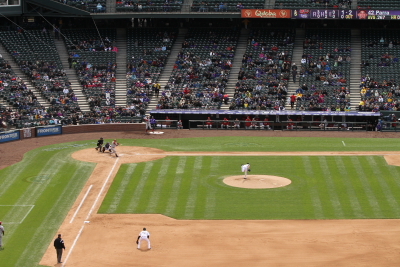 Jaime Wright pitching to the Rockies Wilin Rosario in the 7th inning with Pacheco on first and Rutledge on third. 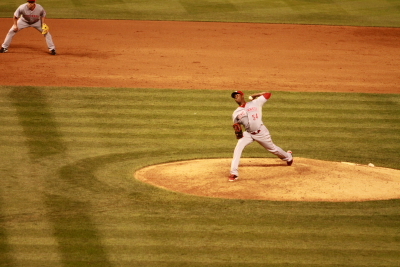 He would get out of the inning allowing 2 runs. 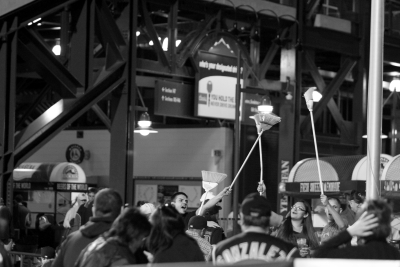 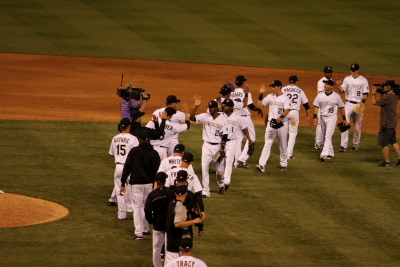 (8-2) Rox. 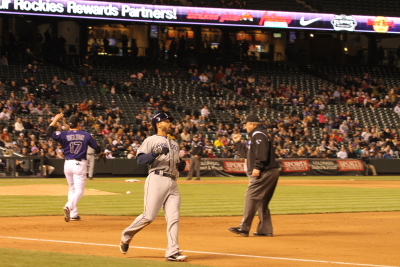 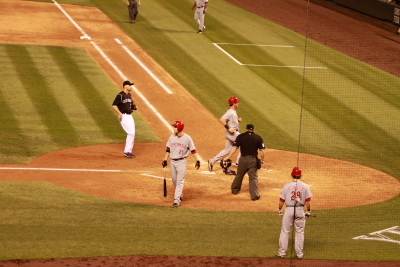 Wilin Rosario returns to first after his 7th inning hit and Pacheco being called safe at third. 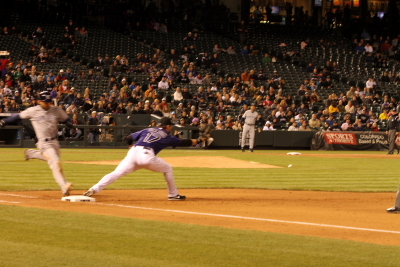 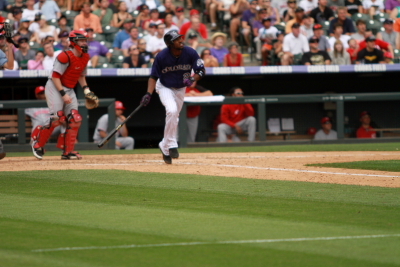 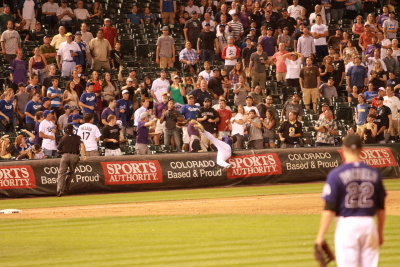 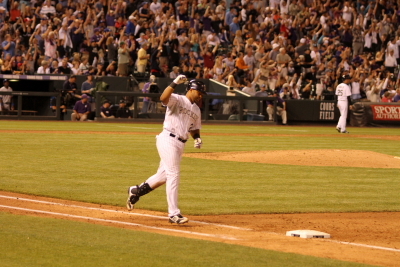 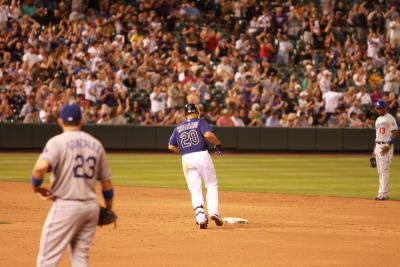 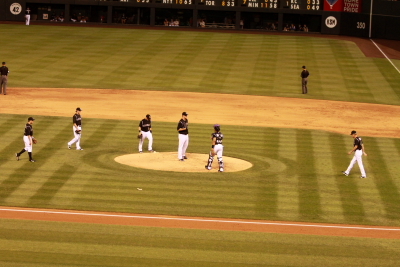 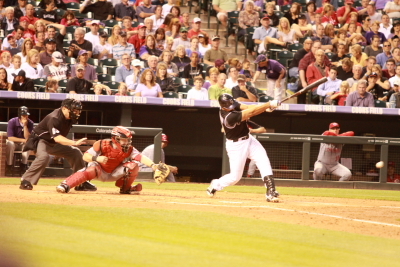 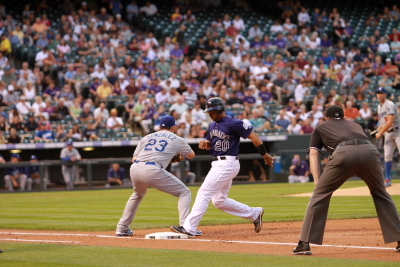 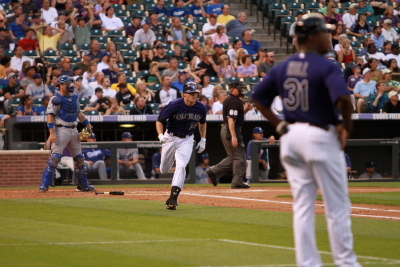 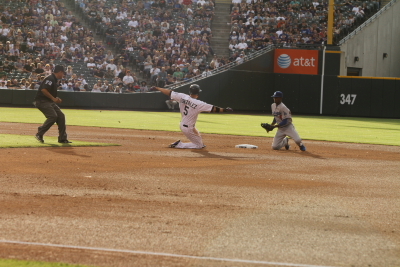 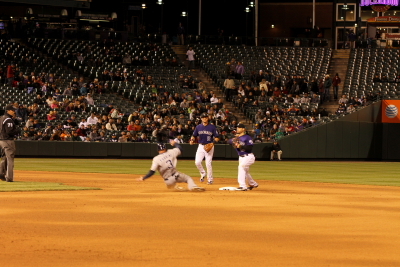 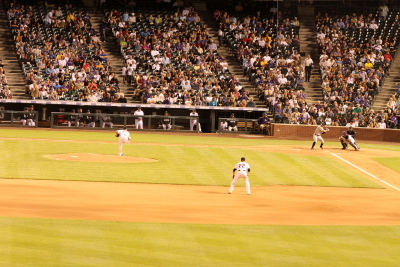 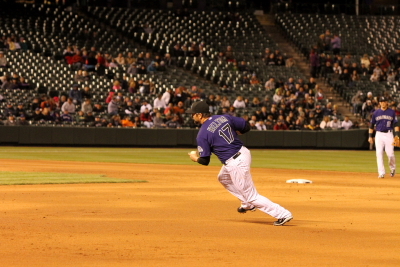 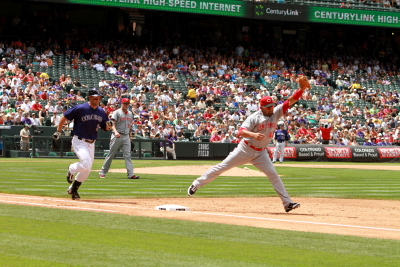 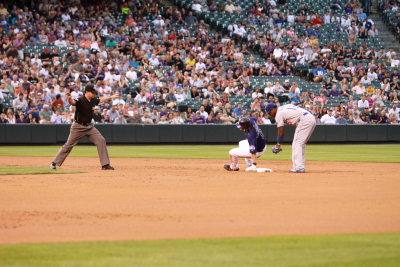 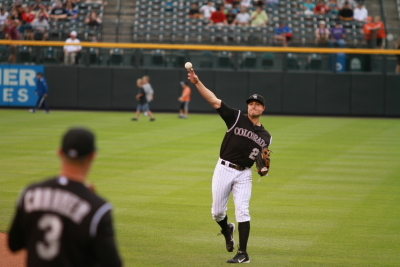 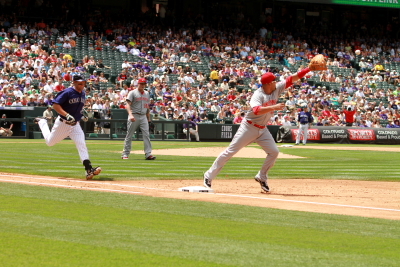 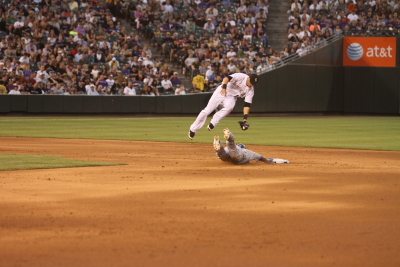 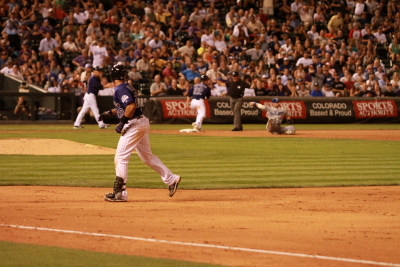 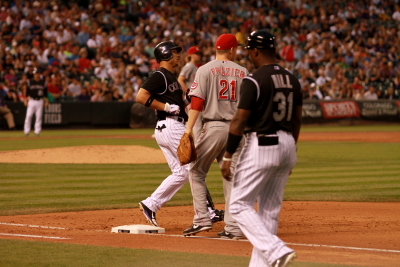 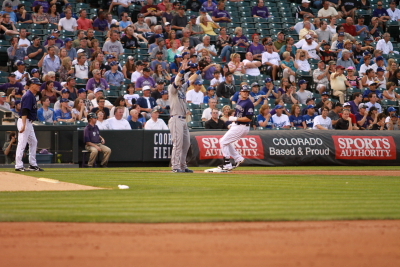 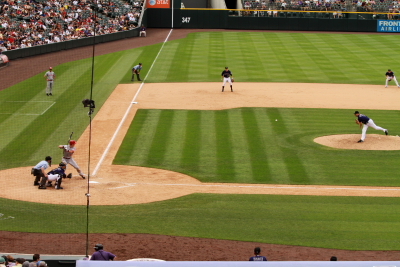 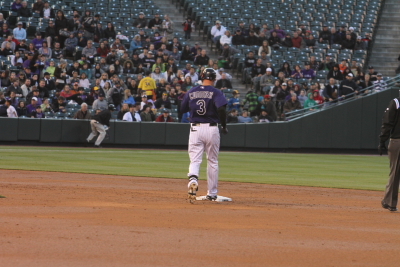 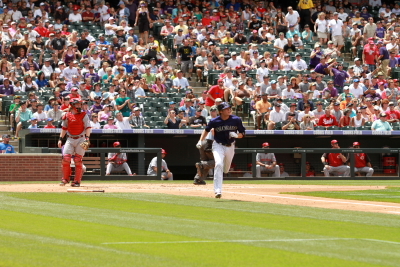 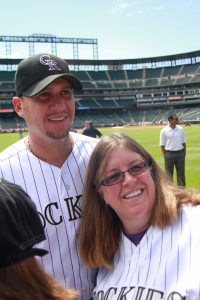 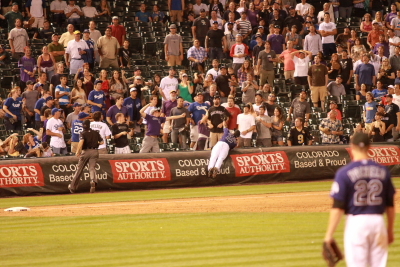 This hit also scored Rutledge for one of the 2 Rockies runs. 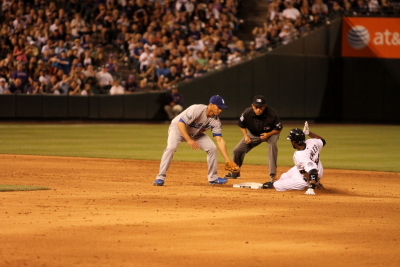 Don Mattingly would argue the call at third. 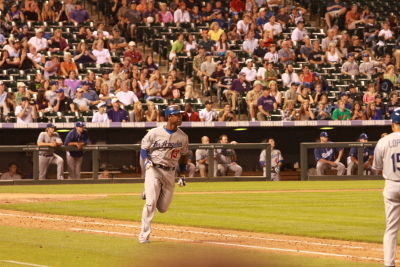 Hanley Ramirez would hit a home Run in the 9th. 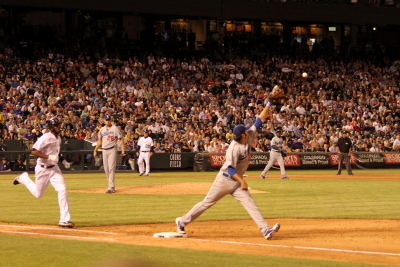 I believe this was his first in a Dodgers uniform. 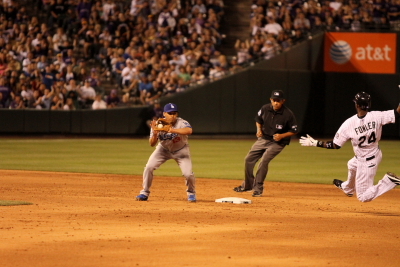 The Dodgers also got a run in the 8th. 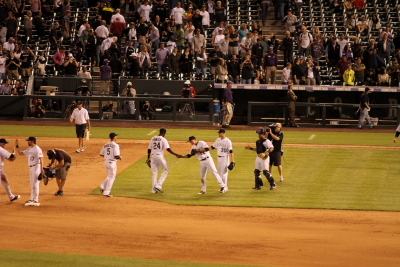 (8-4) Rox. 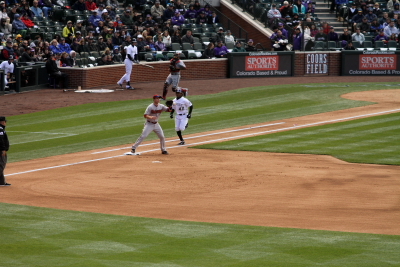 Chris nelson goes for the third out in the 9th a pop out to the third base seats. 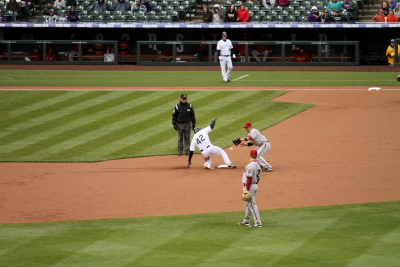 he missed it and went for a ride on the tarp! 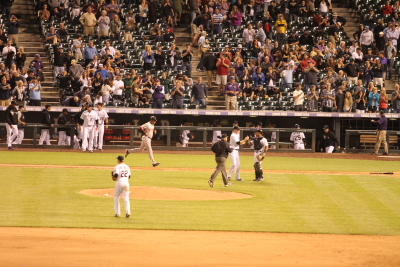 Luis Cruz who pinched hit and struck out to end the game. 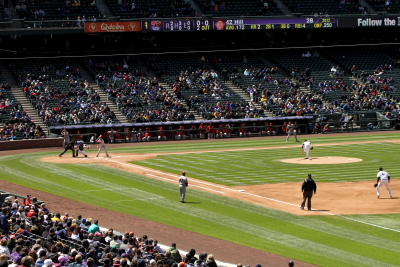 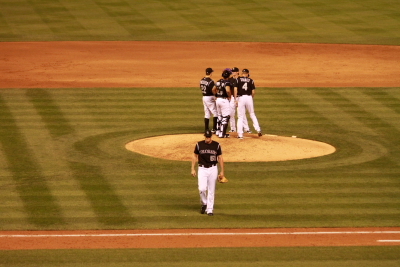 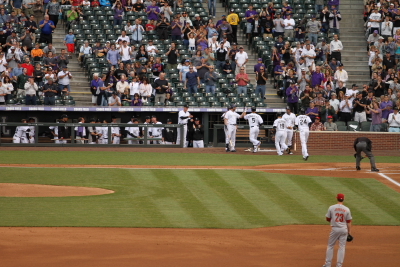 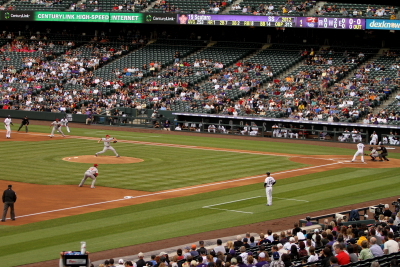 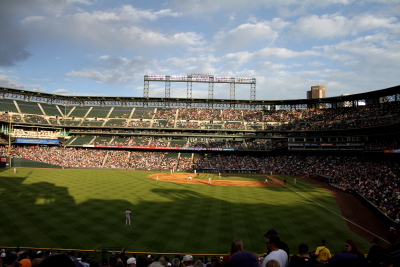 The Rockies win 8-4 to win the second game of this 3 game series against the Dodgers. 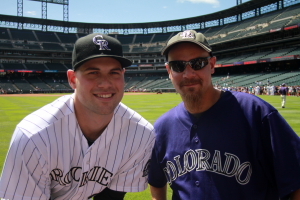 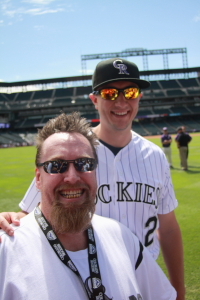 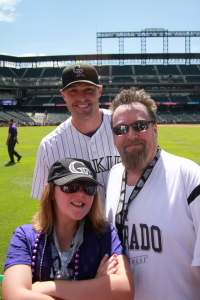 immediately after the game we headed towards the Rockies dugout to get a Adam Ottavino auto Amy needed him on a ball and I had printed a photo of him to sign he stopped and he signed for us. 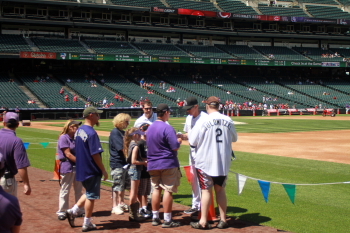 we than headed out side of the stadium and waited for players to come out and I got Clayton Kershaw to sign a card which he personalized and I also got a really cool auto when Matt Treanor came out and we realized Misty May Treanor met up with him. 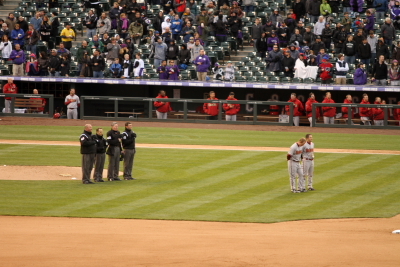 She was actually standing out there most of the time and we did not know it was her. 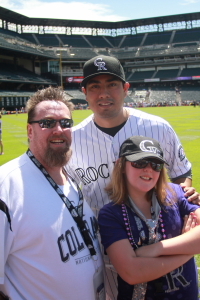 So I got him and her on a ball for you who may not know who Misty May Treanor is, she is a 3 time Gold medal winner in the olympics in women’s beach volleyball with here partner Kerry Walsh. 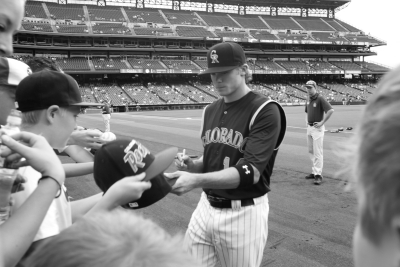 That was just really cool that they signed for us. 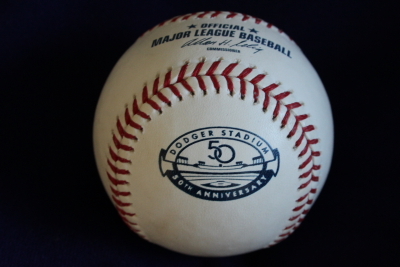 this is defiantly one of the most interesting baseballs in my collection. 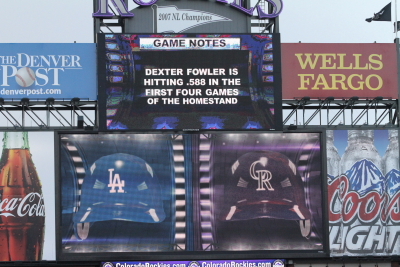 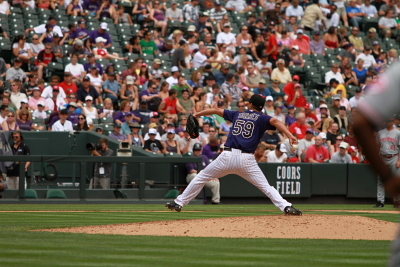 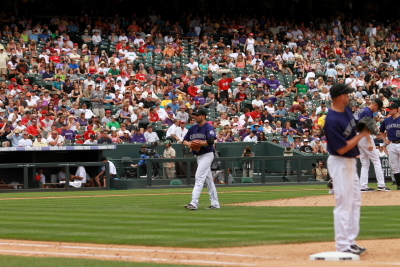 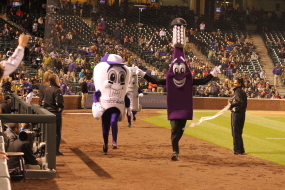 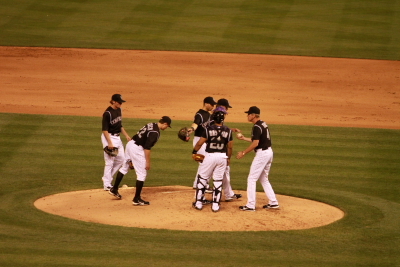 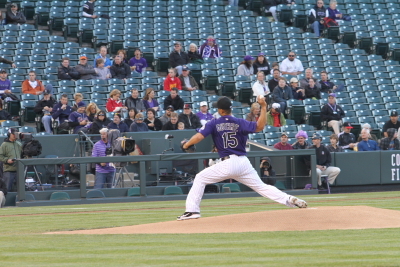 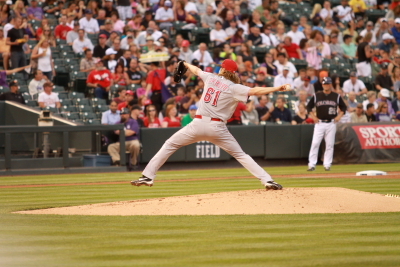 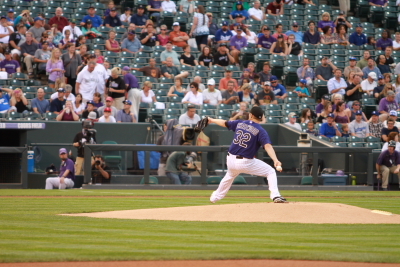 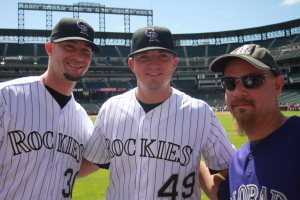 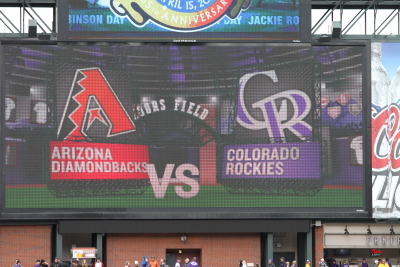 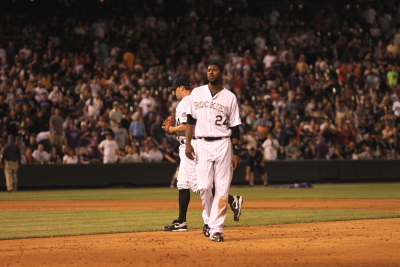 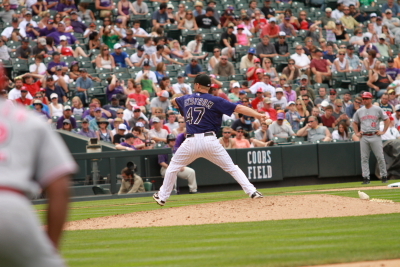 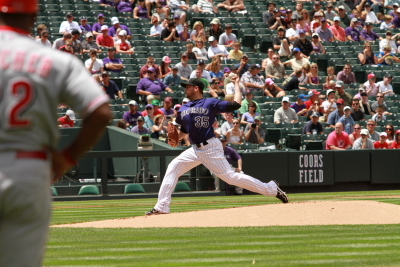 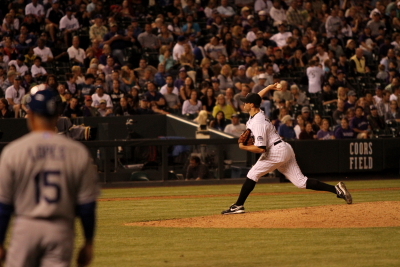 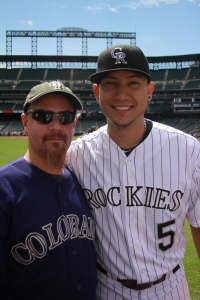 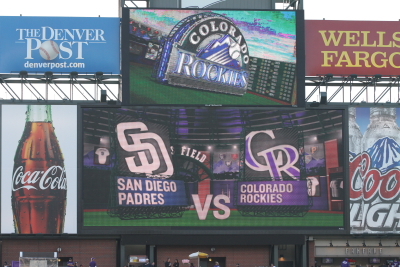 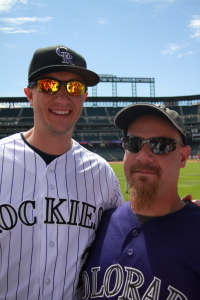 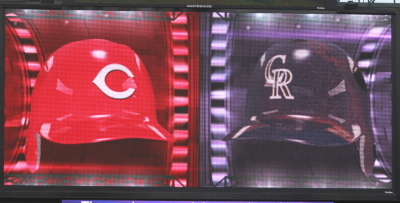 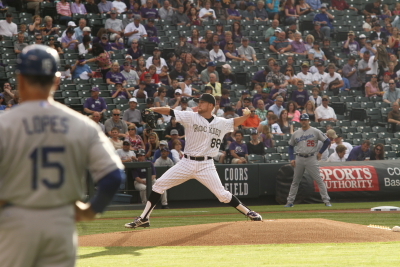 That was it for this one the Rox go for the sweep of the dodgers on Wednesday afternoon. 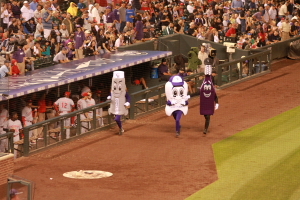 Go Rockies. 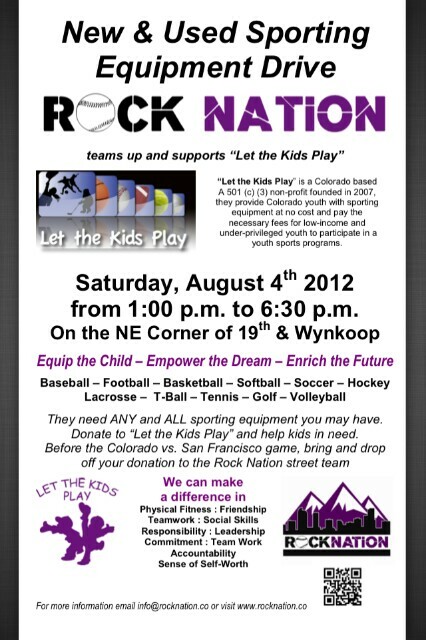 Also a Slight reminder The Rock Nation Crew is doing another used equipment drive this Saturday Sept. 1.